While it's not possible to play Wii U games on Wii, you can continue to enjoy Wii software on Wii U! Nearly all Wii games can be enjoyed on our newest home console, so there’s no need to shut your favourite games in the cupboard. Enter Wii Mode from the Wii U Menu to enjoy all kinds of Wii software* – you can play Wii Game Discs, WiiWare and Virtual Console titles from Wii, or download Wii software (such as WiiWare and Virtual Console titles) from the Wii Shop Channel*. 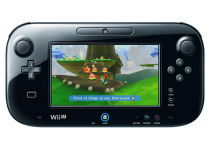 Display Wii games and software on the Wii U GamePad to play away from the TV. Choose to display on both the TV and GamePad, or just the TV. Now you can enjoy all the intuitive controls and fun of Wii on the small screen! Please note: This feature allows Wii software to be displayed on the Wii U GamePad screen; Wii software being displayed cannot be controlled with the Wii U GamePad. To play Wii software, a Wii Remote, Wii Remote Plus and/or other accessories may be required. Please check the game's instruction manual for more information. Loads of Wii accessories and peripherals can be used with Wii U too – depending on the game you're playing you can still use your Wii Remotes, Wii Remote Plus controllers, Wii MotionPlus and Nunchuk accessories, the Sensor Bar from your Wii, the Wii Balance Board and many others! Performing a system transfer lets you move a variety of data from Wii to Wii U, including save data, Wii Shop Channel purchase history and current balance of Wii Points, Mii characters stored in Mii Plaza, Virtual Console titles, WiiWare, and more! The transfer process is very simple and you can find details on which data can be transferred, as well as full instructions on how to carry out a system transfer, at our Wii to Wii U System Transfer Support pages. *Please note: While in Wii Mode, Wii U GamePad functionality and other Wii U-specific features (e.g. Miiverse) are not available.